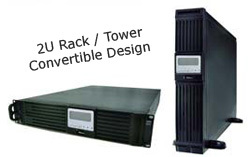 The Orion Power Systems Network Pro offers a compact, flexible form factor for critical file servers, network swtich, hubs, and small computers. With advanced power protection features such as true sine wave output, automatic voltage regulation, and optional SNMP and relay communication cards, the Network Pro system is ready to support. Dim. 3.5"H x 17"W x 18"
Dim. 3.5"H x 18"W x 26"